Now, I cannot call this a super-duper dish, but I love it for its simplicity (making wise and taste wise) :) I end up doing this when I really need some gravy but cant spend time. All is done in less than 5 minutes and it definitely tastes spicy and good. Beat the curd well (add tamarind pulp if it isn't sour) , a pinch of turmeric and set aside. In little oil temper the ingredients, add curd and bring it to boil. Will not take more than 2 mins. Switch off, add salt and give a mix. 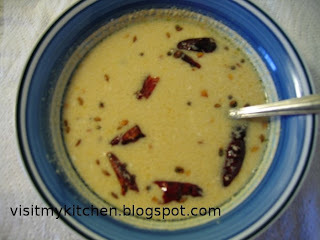 Serve hot with Rice or even like a raitha with spicy dishes.